Working in part-time jobs, even with cerebral palsy (CP), gives high school students an opportunity to gain valuable work experience. It's part of the road map created by the National Career Development guidelines, which outlines 11 skills your youngster needs to learn at the "knowledge acquisition" level during high school. See links to my 20 individual articles in this section about how to develop those skills. Gaining work experience through part-time jobs during high school is essential in competing effectively in today’s job market because it gives your son or daughter an opportunity to hone the “soft” work skills every employer now seeks in a job candidate. That statement comes from Jennifer N. Kemp, Youth Policy Team Leader, Office of Disability Employment Policy, U.S. Department of Labor. “I’ve had a dozen part-time jobs -- from fudge maker and baby sitter to editorial assistant,” says Kemp, who has CP. “I’ve never really faced the situation where I couldn’t get a job when I wanted one,” she adds, looking back on her career of more than 20 years. Kemp was a featured speaker at the annual Careers Conference in Madison, WI, January 26, 2011. She’s showing today’s youth that the old “Catch 22” some individuals with a disability like to repeat (“How can I gain the required work experience for a job when no one will give me a chance to work?”) may still be comforting but not necessarily relevant. Kemp got her first “real” job in 1988 -- two years before the ADA. She credits her soft skills as her key to successfully landing her jobs. She’s been a Senior Policy Advisor for the U.S. Department of Labor and Special Assistant to the Chairman of the President’s Committee on Employment of People with Disabilities. She began her career in the disability field through a Workforce Recruitment Program internship at the U.S. Department of Defense. That’s a challenge. The U.S. Department of Labor (December 2010 Bureau of Labor Statistics) shows employment among 16- to 19-year-olds is 25 percent among non-disabled individuals and 11 percent among individuals with a disability. In the 20- to 24-year-old age group, the gap widens even more: Employment is 60 percents for non-disabled individuals but only 32 percent for individuals with a disability. Communication - How to express personal feelings and needs effectively one-to-one and in a group. Attitude - How to be assertive instead of aggressive. Teamwork - How to value each team member and the role each member plays. Networking - How to find common interests as well as accept and offer support. Problem solving - How to framework personal experience with a situation-task-action-result (STAR) format. Even if your youngster beyond high school or college is unemployed and lacks job experience, I would suggest considering volunteer work at a targeted company or organization to gain the experience your young adult needs. Your youngster can also apply for an internship or apprenticeship as an adult. Adult internships are more common today than in the past when internships were considered only for high school or college students. Soft skills are needed, asserts Kemp, to launch any kind of job marketing campaign. According to Quintessential Careers, on average, one of 12 informational interviews results in a job, while it can take 300 to 1,500 resumes to get a job offer, she says. Kemp maintains the gap in soft skills she often sees between youth with a disability and youth with no disability can be closed not just through work in part-time jobs but also through family, community and school relationships. She has a five-year-old, for example, who recently learned how to shake hands effectively from an uncle. And, if flipping burgers as a way to gain work experience is not realistic for your youngster, Kemp recommends framing what your youngster has accomplished from the perspective of soft skill development. Understand that discovering one’s personal interests, likes, and dislikes is a step toward building and maintaining a positive self-concept. Show respect for diversity as an essential positive interpersonal skill. Recognize that growth and change are essential parts of career development. Achieve a balance among personal, leisure, community, learner, family and work roles. Recognize that educational achievement and performance levels are needed to reach personal and career goals. Realize that ongoing, lifetime learning enhances one’s ability to function well in a diverse and changing economy. Discover that creating and managing a career plan is essential to meeting career goals. Start making decisions within an overall personal strategy for managing a career. Recognize the importance of accurate, current and unbiased career information in planning and managing one’s career. Accumulate fundamental knowledge about the variety of skills that are important for success and advancement in school and work, such as communicating, critical thinking, and problem solving. Realize that changing employment trends, societal needs and economic conditions have an impact on one’s career path. 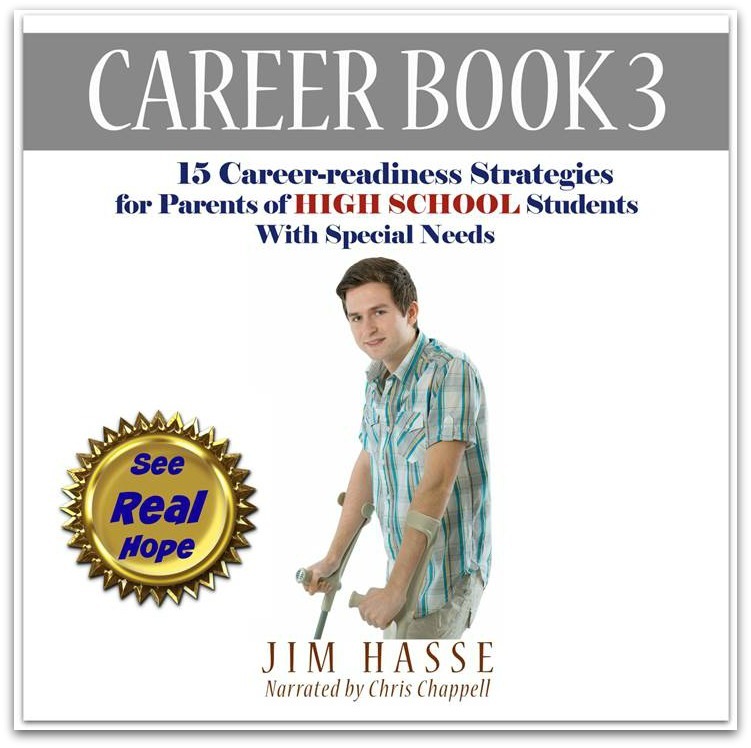 In essence, each of these career builders are small steps toward getting hired in part-time jobs during high school and eventually making the transition from school to work. Since 1997, I’ve met many accomplished people with CP who are successfully working within a wide variety of occupations. Many of them started their careers with part-time jobs. On this site, you’ll find their success stories (and how their parents and other mentors have helped them succeed). Return from Part-time Jobs to Cerebral Palsy Career Builders.